One of the great joys of working with wildlife is never knowing what might cross my path. Driving Back from Canyon Ferry Lake this past weekend I was busy watching the weather and the clouds in the fading afternoon light. You can check out my post from yesterday to see the great skies. As I was driving by a set of ridges, I noticed this sandpiper hovering over the truck. It really caught my attention and at first I thought it might be an Upland Sandpiper which is a really cool and not easy to find bird in Montana. Well after pulling over and watching I saw that the sandpiper wasn’t alone, he had himself a friend. As it turns out the two were trying to mate and that male was doing his long high pitched mating call over the female. Well it didn’t take long to get the 600mm out as they were planning to stick around. After getting glass on the bird I realized it wasn’t the Upland but actually a Curlew. Now we have both Whimbrel’s and Long Billed Curlew’s in Montana and at a distance they are quite similar but that cinnamon color under the wings is a real giveaway that it is a Curlew. These are really cool birds! They are the largest species of shorebirds in North America and they breed in the grassland prairies of the northwest including Montana, Idaho and Wyoming. It’s really quite amazing that these birds only spend between April through July in the north and then fly back down south to New Mexico, Texas and Mexico for the winter. 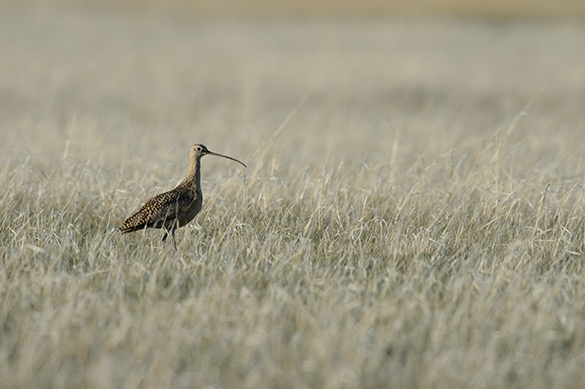 In Montana with the help of local ranchers, biologists have tagged about a dozen Curlews that were nesting on various ranches to determine where they were nesting in the south. The interesting part is they still don’t know where they will end up or how they know where to return to. One tagged Curlew was known to have flown nearly 1,250 miles in 27hours. For myself this short experience really brought back the joys of wildlife photography. Going out and finding a new species and to just break the jynx and get those first few shots while watching the biology happen was just great. Sure it was cold, and windy and I really couldn’t get any better shots but that’s all part of the game. 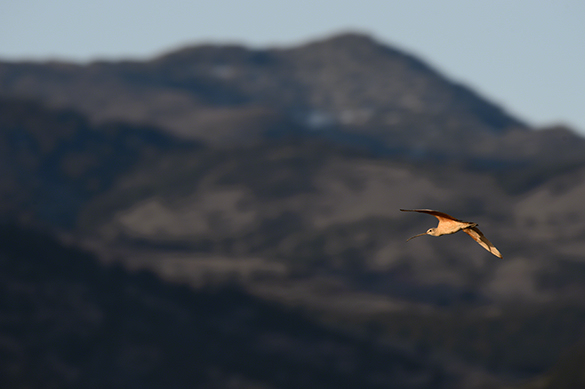 Now I was shooting with the D4, 600mm f/4 and TC-1.7E II Teleconverter and they still wouldn’t come any closer except while flying. The next step, now that I know one spot to find them, is to do more homework and try again another day to improve the files.